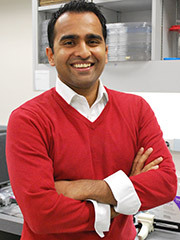 Dr. Ravi's research interests centre on the introduction and improvement of image guidance in cancer therapy. Image-guided brachytherapy is a form of radiation therapy whereby a radioactive source is placed within or in close proximity to the cancerous lesion. There are three research programs within this area where Dr. Ravi is actively involved. Prostate cancer: Introducing magnetic resonance imaging to assist in delineating intraprostatic lesions and the prostatic boundary intraoperatively. Additionally, the use of electromagnetic tracking is being explored as a method to guide needles into the target tissue. Cervical cancer: Exploring the use of rapid prototyping as a method to construct patient-specific applicators that will facilitate the accurate insertion of interstitial needles to treat later-stage patients with pelvic sidewall disease. Of note, the potential for inaccurate placement has to date been a limiting factor in treating this type of disease adequately with brachytherapy. Breast cancer: Studying permanent breast seed implantation, a procedure that involves the implantation of 80-90 radioactive seeds into the target volume of the breast under ultrasound guidance. The seeds are difficult to localize with ultrasound; therefore, the feasibility of using a gamma-camera for real-time image guidance is being investigated. Intraoperative surgical margin evaluation is a novel image guidance system that is being constructed. It is capable of detecting beta particles, which will enable the intraoperative quantitative evaluation of the entire surface of excised tumours and detect the presence of residual cancerous tissue intraoperatively. Ravi A, Reilly R, Holloway C, Caldwell C. Feasibility evaluation of radioimmunoguided surgery of breast cancer. Int J Mol Imaging. 2012;doi:10.1155/2012/545034. Ravi A, Pignol JP, Keller B. A comparison of postimplant dosimetry for 103Pd versus (131)Cs seeds on a retrospective series of PBSI patients. Med Phys. 2011;38(11):6046–52. Pignol JP, Keller B., Ravi A. Doses to internal organs for various breast radiation techniques-implications on the risk of secondary cancers and cardiomyopathy. Radiat Oncol. 2011;6(5):1–6. Ravi A, Caldwell C, Keller B, Reznik A, Pignol JP. Experimental evaluation of an online gamma-camera imaging of permanent seed implantation (OGIPSI) prototype for partial breast irradiation. Med Phys. 2008;35(6):2485–92. Ravi A, Caldwell C, Keller B, Reznik A, Pignol JP. Online gamma-camera imaging of Pd seeds (OGIPS) for permanent breast seed implantation. Phys Med Biol. 2007;52(19):5921–32.